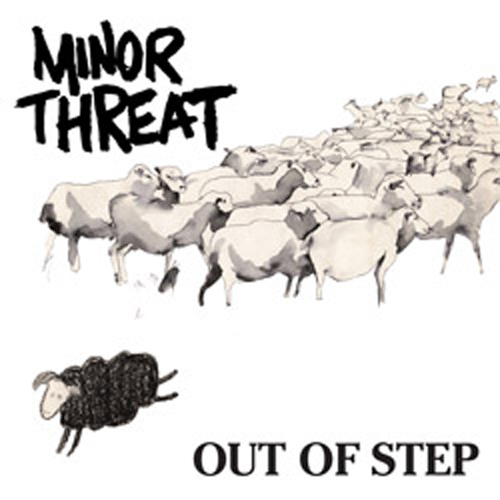 After a temporary break-up in 1982, Minor Threat entered Inner Ear Studios in January 1983 to record Out of Step. Recording duties were handled by Don Zientara. While the lyrics on their early EPs were an outlet for MacKaye&apos;s message, the lyrics on Out of Step deal mainly with friendships and problems associated with them. The first vinyl pressing of the album (with plain black cover) is contained on the Complete Discography compilation. After the second pressing, the band remixed the album, which remained in print on vinyl into the 2000s. The most notable differences are that the guitar on the bridge and MacKaye&apos;s scream at the end of "Out of Step" are added to the remix, and an almost completely different mix of the lead guitars on the final track named "Cashing In" on the Complete Discography, though unnamed on the first two vinyl pressings. The remixed vinyl is distinguishable by a colored stripe with suggested retail price across the front, and "Dischord 10 UK" and "Utopia" in the dead wax. In the mid-2000s, the album was remastered on vinyl by Chicago Mastering Service, with no stripe.